The issue of recycling smartphones and tablets today is extremely up to date. And this matter is getting bigger and bigger every year. In fact, the amount of “electronic” waste, even in more advanced countries, is increasing every day. But at least the attitude of these countries towards this problem, is serious. In 2002, during the sixth meeting of the Conference of Countries on the Basel Convention, the biggest manufacturers of mobile phones Nokia, Sony Ericsson, Motorola, Samsung, Siemens, Philips and LG signed an official document – a declaration on a stable partnership, with the Basel convention and in cooperation with other interested parties, to develop and promote the environmentally sound management of mobile phones at the end of their lifecycle, based on which they must accept mobile phones from customers and “recover them in accordance with the laws on environmental protection”. A similar directive on electrical and electronic scrap is also applicable in the EU countries, requiring equipment producers and dealers of cellular communication to engage in the collection of used devices. The production of mobile phones is complex and high-tech. Mobile phones contain 45% of plastic, 20% of copper, 20% of other metals, 10% of ceramics and 5% of other substances. In order to combine all these elements, a huge amount of energy is required. We can imagine how this affects the environmental situation in the world. Recent studies have shown that the increase in the amount of waste of electronic devices is already three times higher than the growth of household waste. Generally, when we specify numbers globally, we understand that in different countries the problems with mobile phone recycling are resolved in different ways. The phone is essentially a traveler – before it arrives in your hands, it has already been in many countries around the world. Now the entire production is concentrated in the countries in Asia, especially in China. This is due to the excellent investment policy of these countries and to the low environmental standards of production. But raw materials usually have to be delivered thousands of kilometers away from the place of production. After the end of the lifecycle, a huge number of phones are shipped illegally to countries in Africa and Asia, where the population uses them for a few more years. And only then the mobile phone ends its lifecycle on the illegal landfilles, of course, without improving the environmental situation. Recycling results in a return of about 9% of the consumed energy. The recycling of the package of these devices is also very important. The treatment of cardboard and light plastics is not a problem for most countries. From the phone itself are processed from 65% to 80% of the materials and they can be reused. The problem is that the producers themselves do not support this process. Try to disassemble your phone manually. If you have never done it, now you will understand how difficult it is. Imagine the thousands of mobile phones that need to be recycled – to remove plastic from plastic, metals from metals, and so on. It would be much easier for device manufacturers to participate in the recycling process by providing the technology and possible sorting options. The truth is that most people don’t provide their phones for recycling – only a small percentage of the population does it, as they are aware of the damages that their inaction can cause to the environment. Several years ago, Nokia carried out a research among 6 500 people in 13 countries (Finland, Germany, Italy, Russia, Sweden, Great Britain, United Arab Emirates, USA, Nigeria, India, China, Indonesia and Brazil). According to the results only 3% of the respondents have handed over their phones for recovery, 4% have just thrown away their devices, 15% have given them to relatives, 16% have sold them, 44% have kept them at home. 74% of the surveyed users said they never thought about recycling the phone, but 72% have been aware of the importance of this process. According to the experts, the main reason for the low phone recycling rate is the lack of awareness of the fact that this is feasible (although that, for example, the Nokia devices can be recycled at 80%!). If every person of these 3 billion owners of mobile phones recycles at least one device, then the consumption of materials can be reduced by 240 000 tons, and the emissions of greenhouse gases will be reduced by the amount produced by four million cars. Unfortunately, however, due to the reasons as described above, this is not happening and the environment of all countries is damaged. If the harmful emissions polluting the environment are reduced successfully only in some countries, this wouldn’t improve the situation. Because the elements that pollute the environment migrate even from one continent to another. Meanwhile, besides the pollution of the environment, there is one more thing: mobile phones contain precious metals, including gold, silver, copper and platinum. This means that if disposed of, we throw away something that can bring good income. For example, in the treatment of 1 ton of mobile phones, 150 grams of gold can be obtained. According to data of the French company Recupyl, specialized in the treatment of technological waste, at the current level of consumption of metals, the copper stocks will be available for 40 years, lead – 28 years, and tin – only for 17 years. Due to this reason, the company is actively developing ways to extract metals from waste batteries of cell phones. The opportunity to derive benefits from the technological waste is gradually being understood in many countries, where market leaders have emerged over time. These include the Belgium company Umicore, in which the treatment of electronic waste is called “above the land harvesting”. Umicore is not the only company in this area. Since 1999, with the support of the Australian association for mobile telecommunications, there is a program for recycling called MobileMuster in Australia. Using the materials from the waste cell phones, they are creating jewelry and they sell them very successfully. There is a special regulatory framework with regard to the utilization of electronic equipment. Mobile phones, tablets or other similar equipment cannot be recycled in their entirety (i.e. assembled). It is required to completely disassemble the “object” to its components: plastics, glass, metal parts, motherboards, cables, display and so on. After that the recycling companies will melt the plastics, metal parts, glass and, if required, they will reuse them in the production. Motherboards, microcircuits, cables and other small components, which cannot be reused, must be completely recycled. They pass through a special shredder that turns them into fine powder, which later on can be destroyed in the combustion chamber. Due to the high content of toxic substances (for example, arsenic, lead or mercury) the batteries are processed in special plants. Nowadays everyone is talking about protecting the environment and about the negative impact of all types of waste on it. But only few people take specific steps in order to improve the current situation, besides producing the so-called “green” technology, as does the South Korean company Samsung. Not long ago, it introduced the smarthphones Replenish and Restore, which are the most environmentally friendly phones, according to the manufacturer. The devices are made of recyclable plastics. Generally, for their production are used about 82% of materials that can be processed again. There is another way to “fight” old phones and tablets that is much cheaper than recycling. It is about collecting old equipment and sending it to the third-world countries, where it gains second and even third life. Most of the leading telecommunication operators in the USA offer programs collecting old phones. Within these programs, the devices are prepared to be reused and they are sent to people in need. 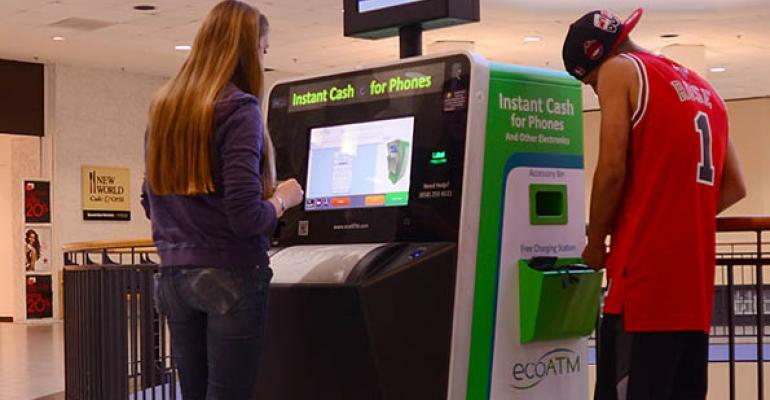 Independent companies such as e-Cycle also buy old mobile phones using a special ecoATM system installed across the country.